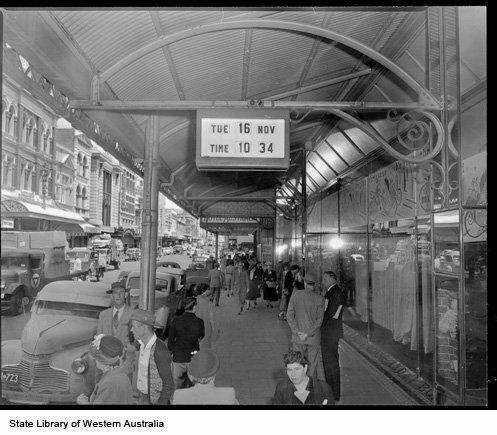 Over the last century, the way we shop has changed a lot – from small shops, to mail order catalogues, to large department stores, to the boutique phenomenon of the ’60s and ’70s, to the large shopping centres of more recent decades – and now in the inner city we’re going back to smaller specialist shops whilst for many it’s still about heading to a large suburban mall. The 1920s and 1930s in particular were a boom time for department stores – and although their numbers have dwindled, you can still see their beautiful structures in many cities and towns. 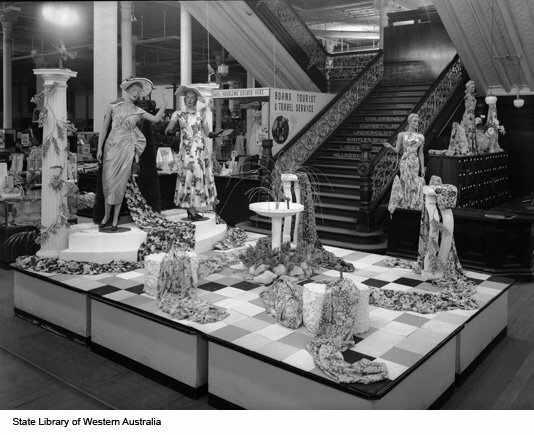 Can you imagine shopping for dresses in a salon-style environment where you might relax with a cup of tea whilst beautifully coiffured and dressed models paraded gowns for your selection? You can see similar scenes in films like “How to Marry a Millionaire”, “Vertigo” and “The Women” (1939 version). 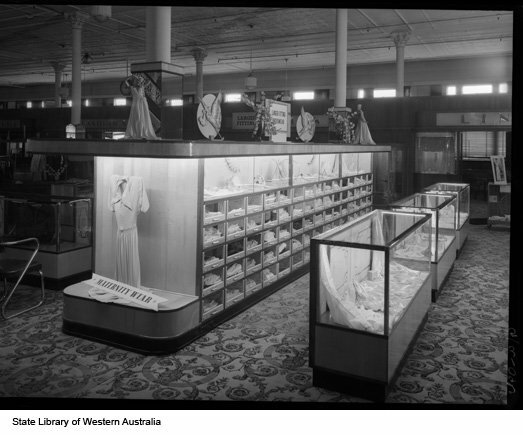 It must have been quite wonderful – especially compared to today’s shopping experience where you’re faced with racks of clothing and don’t know where to start. 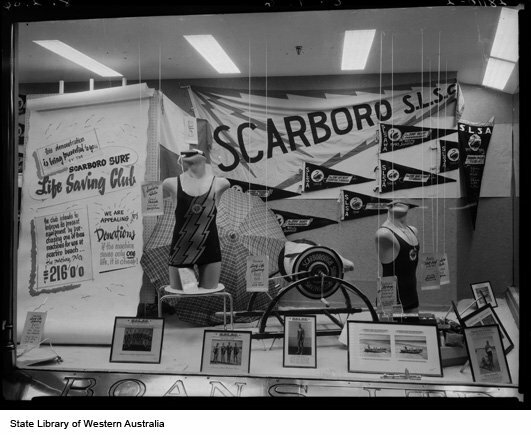 As a vintage clothing retailer, I try to combine the best of modern and old styles of shopping, to produce a pleasant environment – so I’m always pleased to find photos of old shops and their displays. They make wonderful sources for inspiration. 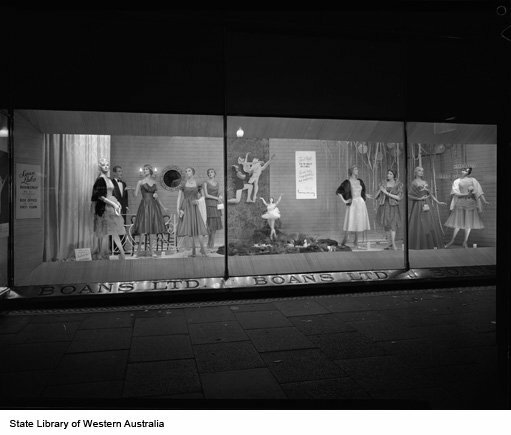 A lady with an interest in local history has found a large cache of photos at Perth’s state library and loaded them up to Facebook – I can recommend the community “Beautiful buildings and cool places Perth has lost” but it was the photos of Boans Department store that made my heart race. 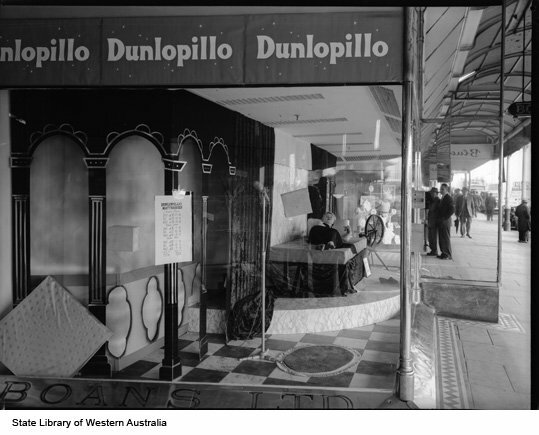 Boans was Perth’s largest and oldest department store, opened in 1895 and rebuilt in 1912 to the building you see below. It sat between Wellington and Murray Streets, opposite the train station and was sold to Myer in 1985. The following year it was demolished to make way for the Forrest Chase shopping centre. 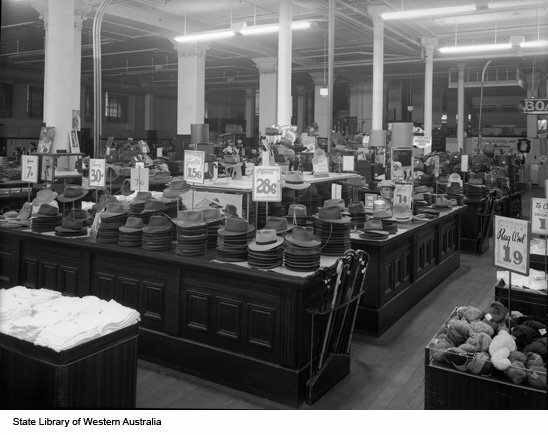 At one time it was the largest employer in Western Australia, and had many suburban and country branches. 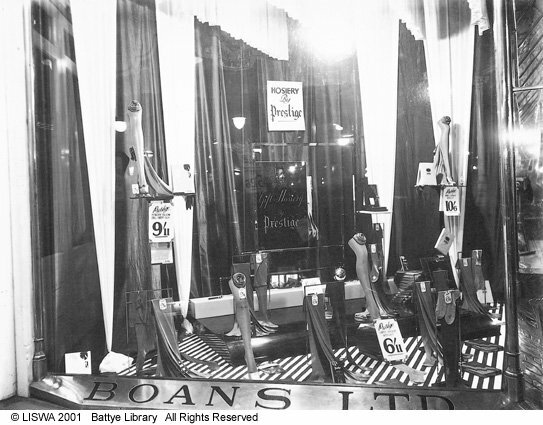 I remember Boans quite well – I used to go shopping there as a child in the late ’70s and would buy haberdashery and fabrics for my home-sewn dresses. 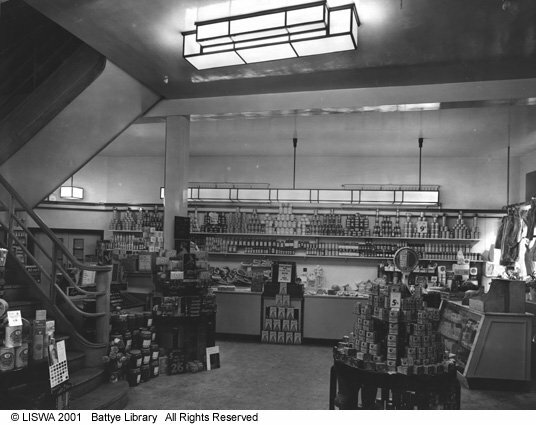 It was a charmingly old fashioned shop and looked very much as it is in the photos below – but by that time it must have seemed very out of date and most shoppers were going elsewhere. 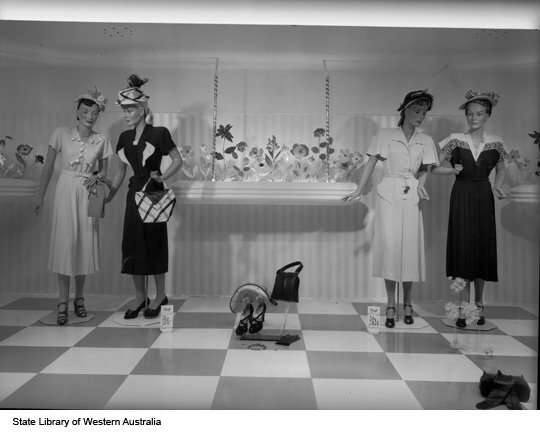 Here are some photos of Boans from the ’30s, ’40s and ’50s – if you click on each, it will come up in full size. 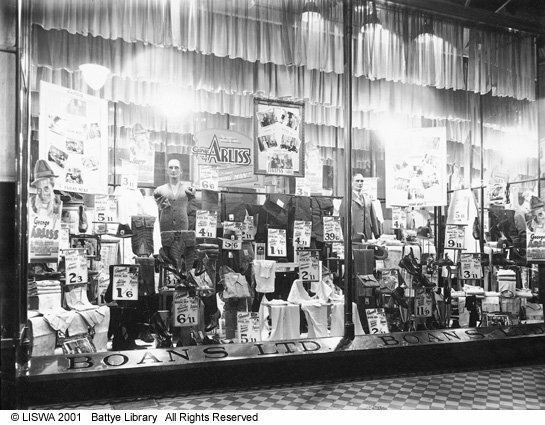 Update: a book has just been published about the store: Boans for Service: The story of a department store 1895-1986 by David Hough. Might have to pick up a copy. 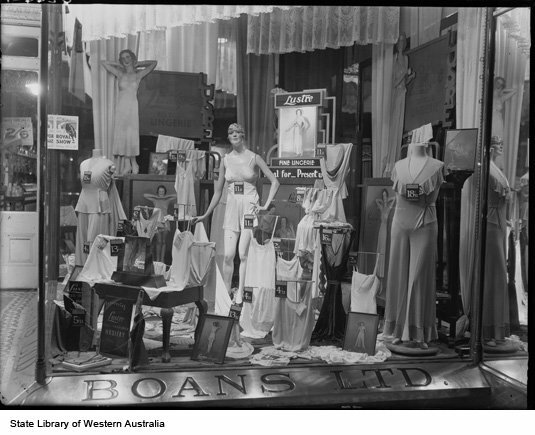 Boans Department Store – 1930s. Ah, Michelle was a stalwart of the Lindy Hop scene in Perth when I was heavily involved back around the turn of the century – am assuming she probably still is with these images! Shame so much seems to be going into the hideous silo of FB these days, even vintage; independent sites are just so much more filled with personality, FB is just so horridly genericised and bland. Hi Cass – this is true, but if Michelle hadn’t put them up on FB I may not have found them. Small world, isn’t it? Not at the moment, although I am giving it some thought: would you like to encourage me? Hey Cass!!! Long time no see/hear. Yes, I’m still a Lindy Hopper and still on the committee and vintage freak. I guess for me, Facebook was the best way to get this stuff out there and I now have 5200 members to my group – which is just mad!! I don’t like FB much either but I have had so many people contact me directly from my page it is insane! I’ve had magazine and radio interviews, been invited to help with an exhibition at His Magestys Theatre about the Ambassadors Theatre…it’s crazy! And the best part is that so many young people are in the group and they had NO idea what Perth was like before the 70s. I love my sister pat and i was looking for another cossie. its is so 50’s and i feel very glam in them, regardless if i am at the beach or wearing ” margaret” with jeans out and about. I purchased a cossie 6 months ago while in ballarat on hols and have conatcted the new owner Rosemary: she is so assionate about the 50’s and classic! I have lived in Perth all my life and am impressed by all of the new things to find out. It really is a wonderful city. 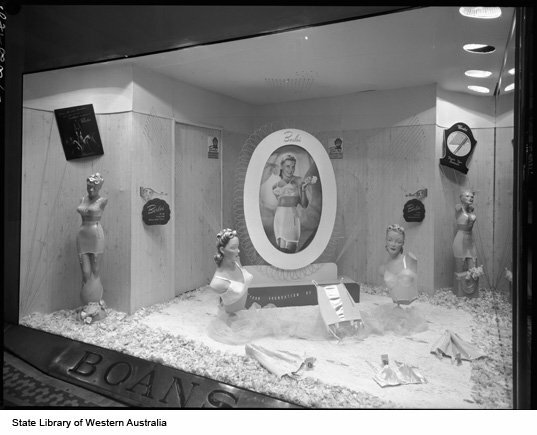 My lovely dad John Kirby worked in the Display Department at Boans from 1955 to about 1959. Does anyone remember the amazing Christmas Displays that he used to design and build? Do you remember the Train that ‘rocked’, the Gnomes that moved etc. I have forgotten some because I was so young myself. Please let me know your memories. Dad sadly passed away in 2006 in London. Train on the top floor where it took you thru the most magical display ever. I remember back in the 60’s ringing the bell at the front of the train, Santa use to be at the front. Anyone else out there have any memories? Those magnificent structural iron pillars which were throughout the store, are now lying dormant in an antique store in Maylands WA. I saw the sample one lying out the front of the shop and knew I had seen it as a kid, standing tall and proud! Apparently there are over 100 of them. – Why isn’t the shire using them?!?! I remember the train and the Christmas display at Boans. It really represented Christmas to me as a child. Well done to Lynda’s dad for designing it. I’ll bet there are a lot more adults now who remember it with fond memories. There was a lot of silver tinsel and snow if I recall correctly. Does anyone have any photos of the train? Message for Sandy who posted on the 1st. Nov. 2012. Sandy, I am so thrilled that you remember the displays that my father designed and built for us kids to enjoy at Christmas time. I miss him so much as we worked together when I was grown up as Scenic Artists (well I was his humble assistant) here in England and did work on many well known films. He was an amazing man and I am honoured to have been his daughter. Hi, I know my grandfather was a CEO or something to do with Boans , I’ve been trying to find out any info about it. Harry Bate was his name . Elizabeth, there’s a link in the post above for a book about Boans – see if you can pick up a copy and it should help. I have the Royal State Coach from the Coronation which was part of the display in Boans window. My father purchased it when the display was dismantled. I believe it has a value in excess of $AUD1,000. I remember going to see the displays riding the train through the grottoes looking at the animated toys and characters,they were amazing and everything was like you had stepped into another world,we were fortunate because the children’s home I was in took us all there as a treat,Perth certainly lost an unique icon when they pulled down the Boans store,we lost some of our history,hence we end up going overseas to places like the UK and Europe to see it. I blame Boans for my cinnamon doughnut obsession! I remember going into Boans on practically every trip into ‘town’ and stopping by with my nana or mum to buy fresh pikelets or hot doughnuts. I was fascinated, watching the doughnuts being dropped into the hot oil through to being rolled in cinnamon sugar. Mmm. 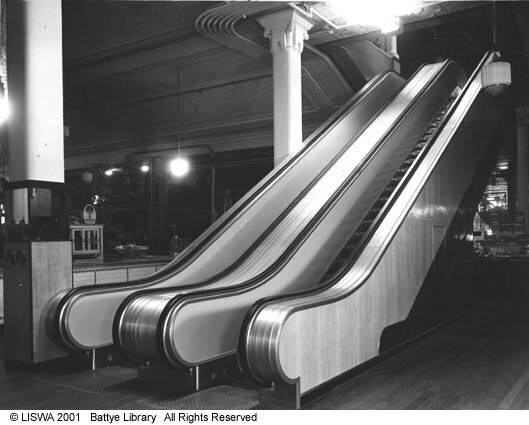 I also remember playing on the grand staircase with my aunty and my new slinky, dropping it down the stairs. 🙂 Would never be allowed now! Traffic hazard. Growing older, I’d live in the habby section choosing ribbons for my hair and wishing I was rich enough to buy all the fabric my heart desired! With you on the cinnamon donuts and haberdashery, Maggie! I used to love visiting straight from school and spending my part time check out chick wages on fabrics and trims to whip up an outfit for the weekend. Good times. Great comments , The Boans bros LTD could teach todays stores a thing or two ! !